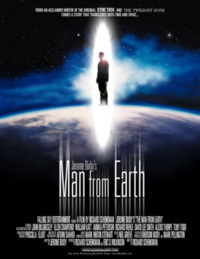 The first is The Man from Earth, a movie written by Jerome Bixby (his last work, in fact, completed on his deathbed) and directed by Richard Schenkman. It’s a very simple story: a teacher quits his job and decides to move away, and his friends come to his house to confront him about it and/or to say goodbye. Eventually he reveals the reason he’s leaving: he is 14,000 years old and moves on every ten years or so when people start noticing that he doesn’t age. How is that for an awesome concept? And it’s beautifully executed, too: the whole movie consists of a group of people sitting in a room and talking to each other, but it’s a million times more exciting and compelling than the lastest Michael Bay blockbuster. It may be set in one room, but it’s based on the power of storytelling, of imagination – and in your mind, you see grand vistas, high mountains and vast plains and the wanderings of one man throughout history. Michael Bay can never get special effects like that. And it’s also deeply philosophical – in a real sense, not in the superficial sense of something like Battlestar Galactica: The Plan. It’s a movie that lingers in your mind and makes you think – about religion, about immortality, about history, about love. If you see this movie with an open mind, you will feel that you were part of something special. In other words, I totally recommend it. Buy it on DVD, or if you can’t afford that, get it on BitTorrent (and later donate some money on the film’s homepage). You’ll be a better person for having seen this movie.